"Today is the first day of the rest of your life..."
Charles E. Dederich spent the better part of two decades wandering the country as a barely functional drunk. A sales exec from Ohio, Dederich moved to Southern California after his first divorce, and in 1956 gave Alcoholics Anonymous a good faith effort at the insistence of his second wife. She chose to leave him anyway, but the program really resonated with Dederich, who quickly became a sober evangelist for everything AA stood for. Dederich was only dismayed by one fact: AA didn't accept other kinds of substance abusers to their meetings. Dederich is credited with a lot of positive innovations early on in his career as a drug rehab guru. He focused on a marginalized group that most institutions wanted nothing to do with. He was said to have coined the phrase "Today is the first day of the rest of your life." He was stern with the people around him, but he believed this tough love was necessary to achieve and maintain sobriety. But Dederich made it quite clear early on that treating addicts was merely a byproduct of his larger mission. He wanted to create an experimental society that would transform the world. Over the years, the organization grew—it built businesses and started schools—and its goal was no less than a utopian revolution. Synanon was a new way of living, as important to its members as any of the world's major religions. "This is the kind of revolution that moved the world from Judaism to Catholicism to Protestantism to Synanism," Dederich would insist. "This is a total revolution game." "He was the first person I have ever met that was able to somehow able to cut through the nonsense," one early Synanite said in a film referring to Charles Dederich. "He struck a chord." That chord was one of supposed honestly, with Dederich's brash and booming voice dominating whatever room he entered. And that booming voice made him a worthy opponent in a brutal form of therapy created by the man himself. It was called The Game. The Game was the medicine administered later, a kind of group therapy invented by Dederich where people sat in a circle to express (and often shout) their frustrations at each other. The confrontational approach was a way to hash out everything that bothered you about others in your group. It was supposed to help you learn about yourself as well. While playing the Game, your frustrations didn't even need to be true. Lying was just one of many strategies in The Game, which could last anywhere from one to 48 hours. As Rod Janzen notes in his book about Synanon (a book, it should be noted, that's bizarrely sympathetic to the cult and its methods), Dederich's writings suggested that the Game start with a question like "The most boring person in this circle is ____?" or "What really pissed you off most this week?" Many of Synanon's neighbors in Santa Monica weren't terribly excited to have a drug rehab facility in their neighborhood. The Synanon members faced harassment early on, some of it unjustified and rooted in racism and fear of addicts, some of it seemingly more deserved. In 1961, Dederich spent just under a month in jail for zoning violations and operating a hospital without a license. In this case, he was guilty on both counts. Those events and persecutions only served to make the Synanites more cohesive as a group, and elevated Dederich to martyr status, suffering unjust incarceration for his beliefs. It also didn't lead anywhere; at this point, the group was firmly committed to non-violence. But it wouldn't be until much later that Synanon would take its revenge. Soon, that would change. In the early 1960s, the Synanon house became quite the fashionable hang-out for Hollywood's more cerebral celebrities. Guest speakers in 1963 alone included Twilight Zone creator Rod Serling, legendary sci-fi author Ray Bradbury, and the original host of the Tonight Show, Steve Allen. Other visitors included Leonard Nimoy, Jane Fonda, Charlton Heston, and Milton Berle, among dozens of other curious stars. Synanon had some pretty cool parties, thanks to the fact that so many jazz musicians were around trying to kick their habit. But it wasn't just the Hollywood elite and L.A. musicians lining up to get a peek at the exciting things happening in Santa Monica. Others who couldn't resist poking their heads in for a look at the program included counterculture drug aficionado Tim Leary, futurist Buckminster Fuller, and labor activist Cesar Chavez. Politicians also came knocking. Senator Thomas Dodd from Connecticut claimed in 1962 that, "There is indeed a miracle on the beach at Santa Monica." Jerry Brown Jr., the current governor of California, even visited Synanon while with his father in the mid-60s. Synanon was widely held up as a tremendously successful program by countless politicians well into the early 1970s. No wonder, given the kinds of numbers Synanon was reporting. Dederich's organization insisted recovery rates were anywhere from 80 to 100 percent, though those figures were never confirmed by outside sources for obvious reasons. It simply wasn't true. Some observers claim that fewer than 70 people in Synanon's entire existence—of the thousands who sought treatment—could reasonably have been claimed as rehabilitated, though it's probably somewhere in between these extremes. It's especially tough to judge rehabilitation rates when a program's founder eventually comes to claim there's no such thing as rehabilitation, and that staying within the organization is the only true path. That year it also reached a high-watermark of public awareness: It got the Hollywood movie treatment. The film starred Edmund O'Brien as Dederich, and was even filmed on location in Santa Monica with the full cooperation of the Synanon organization. In 1967, Synanon also purchased a palatial new building in Santa Monica called Club Casa del Mar. First built as a hotel in 1926 and then used by the US Army during World War II, the building sat on a gorgeous spot on the beach. Now a hotel again, you'd never know its bizarre history if you walked inside. One reason for the Synanon's rapid expansion? The organization was fast attracting non-addicts into the fold. Aside from the bevy of celebrities that would make appearances, locals who had never been considered addicts (squares, as Synanon called them) also wanted in. They were reluctantly allowed, and by 1967 Synanon broadened its mission to include "research into the causes of alienation and delinquency." Synanon's ranks were swelling. After starting in 1958 with just 40 junkies in a rundown building, it now boasted 823 members and some incredibly expensive digs to boot. This experiment with Lifestylers wouldn't last long, however, as this type of member was often accused of not being committed enough to the cause. Most Lifestylers washed out of the program, though some joined the ranks fully, leaving their homes behind as a show of true commitment. By 1968, the group was becoming even more isolationist, with Dederich declaring that it would no longer graduate any of their members. This meant that no addict who kicked their addiction would be allowed to "graduate" to a life outside of Synanon. What little pretense the group had about helping addicts rejoin the outside world had been dropped. Synanon was now the only place to be, a narrowly focused utopian experiment that was ready to swallow you whole. Children inside the Synanon cult were raised communally. This was a common practice romanticized by utopian communities of the 19th and 20th century (including in Upton Sinclair's failed Helicon Home Colony), though Synanon took it a step further than most. "Dederich and others displayed a good-riddance attitude," Janzen writes in The Rise and Fall of Synanon. "Those who left lacked commitment to Synanon's new utopian vision, they said." The choice was clear: Your family, or that of Synanon. Synanon was a completely drug-free environment, save for aspirin, caffeine and nicotine. But there was another drug that Dederich didn't consider harmful. In fact, he credited this drug with expanding his mind and allowing him to create the Synanon program in the first place. That drug was LSD. Chuck was an atypical patient in that he experienced no regression, no sensory enhancement or hallucinations. During the active period of LSD intoxication, his normal traits appeared merely in a sort of caricature. One phrase that came into his mind impressed him: "It doesn't matter, but, at the same time it matters exquisitely." He would go to his room and give way to tears for an hour or more every day. Even with the seeming grief, there was euphoria. A pivotal moment occurred in 1973 when a woman was speaking disrespectfully of Dederich's wife Betty during a session of the Game. This, of course, was part of the Game, but for whatever reason, this time Dederich took it very personally. Dederich grabbed a can of soda and poured it on the woman. At first, he apologized, but he almost immediately recanted his apology and rationalized his behavior as justified. "I gave the woman a lesson in manners," he explained. After abandoning drug treatment as its sole mission in the 1960s, Synanon could no longer claim to be simply a non-profit organization. And its substantial for-profit businesses weren't helping its case. Becoming a full-fledged religion was the best way to protect its massive holdings from the tax man. It didn't work, though. The IRS never officially recognized Synanon as a religion, though it would be at least another decade before it finally stripped the company of its tax-exempt status. At the same time it was claiming its religious rights, Synanon stepped up its use of violence within its ranks. Suspected "spies" were severely beaten. Teenagers sent to Synanon to help cure juvenile delinquency were regularly physically abused for insubordination. Everyone in the group started shaving their heads. Things were gradually, but steadily, getting worse inside the sober cult of Synanon. Dederich was also becoming less interested in having any children around, telling many members that if they wanted to have kids they probably shouldn't be a part of Synanon. "I understand it's more like crapping a football than anything else," Dederich would say about childbirth in 1976. By January of 1977, Dederich's distaste for children turned into an official policy. Men were pressured to get vasectomies, and women were shamed into getting abortions. These policies instigated another wave of defections, though Dederich's increasingly inward focus caused him not to care. As Rod Janzen notes in his book about Synanon, one member told Dederich, "I'll give you my life, Chuck, but not my balls." Notably, Dederich didn't get a vasectomy himself. Those that stayed, completely beaten and indoctrinated, didn't seem to care that Dederich had become a tyrant who couldn't even pretend that he held himself to the same standard as other Synanites. Chuck Dederich's wife Betty died of lung cancer on April 19, 1977. After that, all bets were off. Betty, a strong woman in her own right, seemed to dial back some of Chuck's weirder megalomaniacal tendencies. After her death, nothing could temper his darker desires to control people. By October of that year, only a few months after the death of his wife, Dederich's policies became even more extreme and controlling. He declared that married Synanites should split up and find new partners. He started by breaking up his own daughter's marriage. About 600 couples were divorced by the following year. At the same time that Synanon was becoming increasingly militant and strange, it was enjoying substantial support from American businesses as a charitable organization. As Richard Ofshe notes in his 1980 paper The Social Development of the Synanon Cult, there were 20,000 businesses and organizations giving to or interacting with Synanon by the late 1970s, "including one out of five corporations in the Fortune 500 who were listed either as donating or as doing business with the organization." By the late 1970s, Synanon was going from bad to worse in some terrifying ways. The group's reported purchase of over $200,000 in firearms in 1978 raised plenty of eyebrows. If you were on the fence about Synanon's classification as a cult before, you certainly had fewer doubts now. In 1978, ex-Synanite Phil Ritter would try to extract his young daughter from the organization and nearly paid with his life. Ritter's wife was still in the organization, and had moved with their child to Synanon's Detroit facility. Ritter sought legal action against the cult and in response, the church sent two men to beat him senseless in his own driveway. He wound up in a coma for a week. 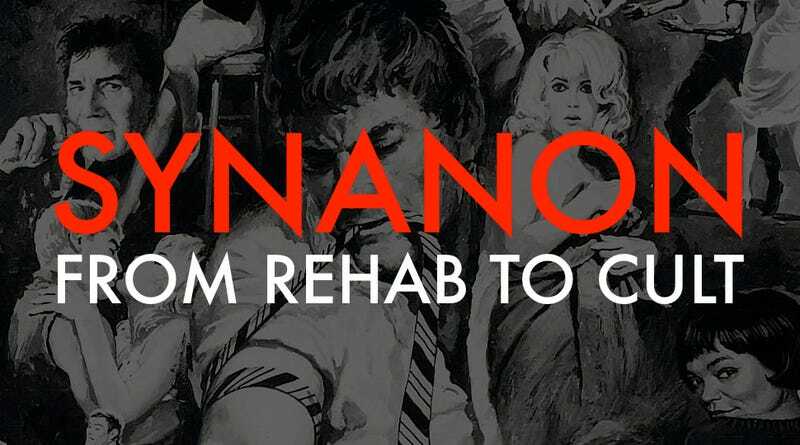 During the 1970s Synanon attracted a fair amount of attention from the media, though unlike the positive press it was getting in the 1960s for its drug rehab "successes," the coverage was overwhelmingly negative. Major news networks had started slowly reporting on the organization, but much of the legwork that went into exposing Synanon as a violent cult was done by a tiny newspaper with a circulation of only about 1,700. The Point Reyes Light in Marin County was dogged in its pursuit of the Synanon story, which involved child abuse, wrongful imprisonment, assault and misappropriation of funds. Despite being constantly threatened for libel action, the paper didn't back down. The Light even won a Pulitzer Prize in 1979 for its reporting on the organization, something virtually unheard of for a paper of that size. Members of Synanon didn't take kindly to the criticism. The group lashed out at anyone who dared question their organization; after an expose by NBC in 1978, members sent hundreds of ominous letters to NBC executives, threatening physical harm. Synanon also spent the 1970s suing anybody who wrote a critical article or aired a negative TV segment about it. In 1972 it sued Hearst Corporation over a San Francisco Examiner article that described the cult as the "racket of the century." When it was finally revealed to the broader public just what a financial and emotional scam Synanon had become, this was no longer considered hyperbole. The most famous incidence of the organization's violence—and the one that Americans old enough to remember may recall—was a planned attack by Synanon on a Los Angeles lawyer. It's remembered largely due to the bizarre choice of weapon: a rattlesnake. Dederich's obsession with recording audio came back to haunt him, as the police produced tapes of him talking about violence and specifically mentioning Morantz's address in the Pacific Palisades. All three plead no contest and Dederich entered into a plea deal that included probation, though he didn't see jail time. The other part of the plea: Dederich would have to step down as head of Synanon. It should be noted that I filed a Freedom of Information Act request with the FBI for Dederich's file but was told that he had none. Paul Morantz knew Synanon would try to kill him. He just didn’t know how or when. Synanon's reach was relatively limited, and yet everyone that came in contact with the organization left with battle scars. The cult hobbled along throughout the 1980s, badly damaged from their wars in both the press and the courtroom. Who wanted to be associated with the rattlesnake cult? Relative to other cults of the second half of the 20th century, Synanon wasn't the worst. But if you stuck around with Synanon in the 1970s, you would've felt right at home in some of the most notorious cults of the 1970s and 80s. Synanon started with what looked like the best of intentions. And the organization still has defenders today. But no matter what the initial goals of this strange community and its heavy-handed leader, there's no denying what it had become: a dangerous cult ultimately tossed on the scrap heap of failed utopias. That's what happened at Synanon. Members ignored the greater sins for the smaller ones. As members became more and more invested in the utopian project's minutiae, it became harder and harder to escape. Ultimately, Synanon collapsed under its own utopian hubris—a tyrant's ant farm masquerading as a grand experiment with the good life. And for some of the bruised and battered left in Synanon's wake, its undoing came none too soon.